In a very close second place was Kaitlyn Parker, with 151.3 points. 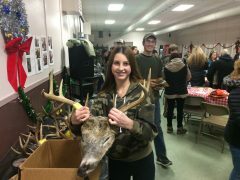 Kaitlyn also won the $25 Youth Hunter prize…congratulations to Kaitlyn, we believe this was her first deer! Kaitlyn joins her brothers Nolan and Caleb as Youth Hunter winners…the Parker family has won this award for 3 years straight! In third place, with a score of 139 was previous winner Richard Winter. 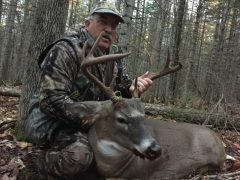 The other 15 hunters were then invited to the prize table in order of their score, followed by a draw for all the other hunters who were there. Everyone went home with a prize thanks to the over 35 area businesses and individuals who donated something to this fundraising event, with the proceeds going to support Township recreation programs and events. The event raised over $350 towards the support of recreation in the Township of Johnson. Royal Canadian Legion Branch 211 from Bruce Mines once again offered bar service for our patrons, raising money for their community-oriented causes. Thanks go to students of the Sault College Fish and Wildlife Program and their instructor Rob Routledge who were on hand to make the measurements. The Johnson Township Recreation Committee would like to thank a host of volunteers who help make this event a success: Cheryl Larrett, Terry Barber, Cory Moore, Busting Water Tackle, 17E Trading Post, Perry’s Gun Shop, and McClelland’s Hardware and Feed for spreading the word, taking registrations, and collecting registration fees; Cory Moore and Zahida Crosskery for collecting draw prizes; and to Marlee Hopkins for acting as doorperson. We’d also like to thank all the local businesses who responded to our call for draw prizes and all the individuals who brought in a prize in support of the event.